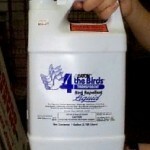 PRODUCT DESCRIPTION: Liquid material sprayed onto surfaces where nuisance animals are walking, roosting or causing damage. It will act as an irritant and its gooey gluelike consistency will cause nuisance pests to go elsewhere. WHERE TO USE IT: Generally on non-porous surfaces such as awnings, louvers, shutters, gutters, plastic, metal and trees. It will last several months when applied to these areas. If the surface is porous, it may absorb which will result in a decrease in effectiveness but it only takes a day or two for targeted animals to realize they must search elsewhere so in most cases it will accomplish the task. 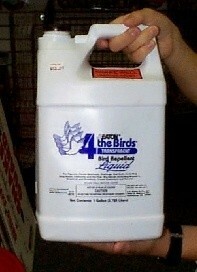 RATE OF APPLICATION: One gallon can cover up to 1000 sq/ft. Use a pump sprayer for applying it or paint it on.